Version 1.00 : 2012/07/20, Initial version. 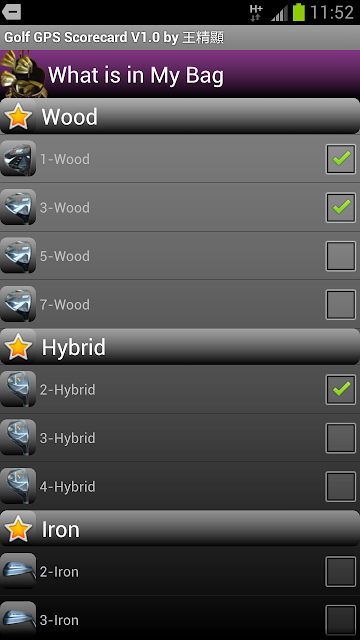 Add #5 hybrid option in "What's in My Bag" . Add Traditional Chinese version. Improve user interface largely, particular the camera view and layout in "My-Shot-Screen". Add "Game Statics" function. Improve user interface, add "sparkle text" on current GPS position to remind user.Improve user interface, change the input method for "Hole" and "Par" settingClick the "Hole" or "Par" button will increase by 1. Long click the "Hole" or "Par" button will decrease by 1 .Improve performance and bug fixed. Date button: Sorting games by date.Course button: Sorting games bycourse name.Score button: Sorting the games by score.Game item:Long-click the game item will delete the game, click the game item will go to the "my-score-screen" to see the score of the game. Long-click on the game item, will pop up a dialog to confirm that if really want to delete the game ? Click on the on the "game item", will go to the "my-score-screen". 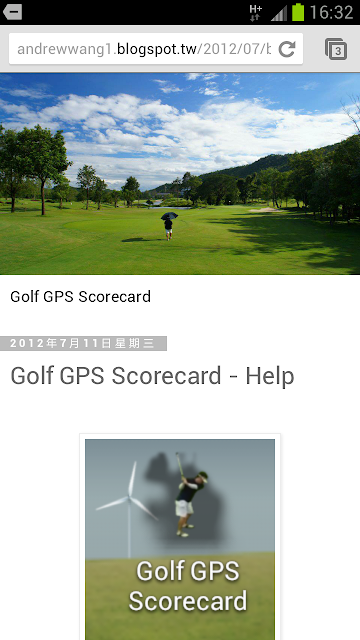 From the "my-score-screen", click the "hole-list-item", will go to "historical-map-view" screen. Tap the "star" sign, will show the picture (taken when you record the shot in the "my-shot-screen"). The purpose is to help you remember the fairway. Snapshot function Snapshot the whole screen and save onto your phone directory﻿. Once completed, the Android Toast message displays the saved file path and file name. Almost all the screens has the Snapshot function. The saved snapshot file. It's path as Under the External SD (/mnt/sdcard) and "ggScordcard" folder, you can find lots of folders depends on how many "games" created The "game folder" named by "date" + "time" + "course name"
Setting what's in my bag, only the club checked here will show up in the "my-shot-screen" to pick up. Click the "hole-list-item", will transfer to "historical-map-view" screen. 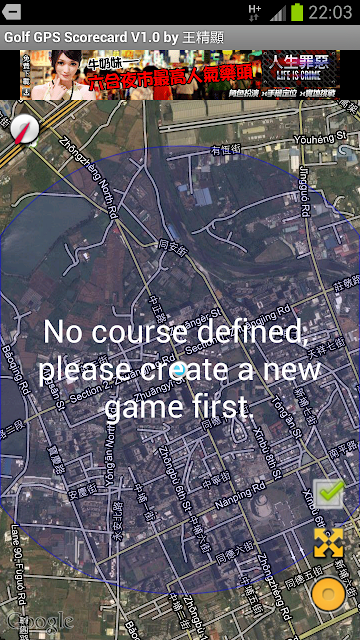 The warning message "No course defined, please create a new game first." show up in the middle of the screen if no game defined on the day. Press the "New Game" option menu item to create a new game, it will pop up the dialog to let you enter the golf course name. 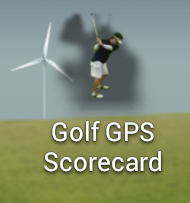 After game created, date, time and course name will show up in the top of the screen. By now you can start to record the shots. The "blue-white-point" represents the current GPS position.The "outside-blue-circle" means the current GPS signal accuracy. The bigger the "outside-blue-circle" is the worse the signal accuracy is. GPS needs time to located the position, usually 30-60 seconds after you move to another position. RecordGPS path and take fairway picture for every shot every hole.Recordclub used for your every shot in "my-scorecard-screen". 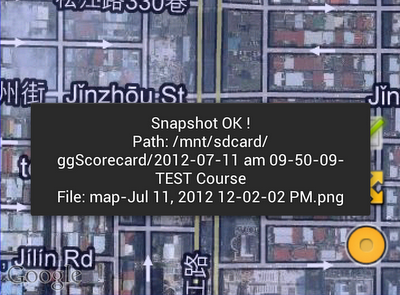 Show distance (without slope/ with slope) between shots.Snapshot app screen ("map-view-screen", "historical-game-list-screen" and "scorecard-view-screen") and save it as .png file on phone for later use and reference, for example, post on Facebook, sharing with friends, as your course reference and so on.Query historical games, Historical games query and sort by "Date", "Course" or "Score". Historical-game-list screen showing you score, penalty, put, used club. And historical-map-view screen provides your every shot GPS position and pictures.Setting for your "What's in My Bag"